Russia's done it. Now Iran has, too. It’s all a big game of whack-a-mole. People living under repressive regimes all over the world organize protests via social media and private messaging apps. Their governments try to squash them. Shutting down those digital platforms where dissidents connect is one more tool at governments’ disposal. But it never really works the way governments intend it to. In fact, it usually just makes protesters dig their heels in deeper. After protestors in Iran began using Telegram — a popular messaging app that provides server-client encryption, and optional end-to-end encryption to its users — the regime decided to shut it down altogether (it’s still accessible to most Iranians as of Monday, the Wall Street Journal reports). Thousands of Iranians access the news and message others through the app, all without going through the government’s filters first. By blocking the app, the government is effectively curtailing citizens’ freedom to access unbiased and uncensored information, not to mention limiting their freedom of speech. Sounds pretty dire, doesn’t it? But the reality isn’t quite so bad. Other governments around the world have endeavored to shut down platforms that block information from government agencies’ prying eyes. Russia also banned Telegram last month. It did what it was meant to, but also inadvertently knocked out Amazon Web Server (AWS) service for millions of sites. What a mess. 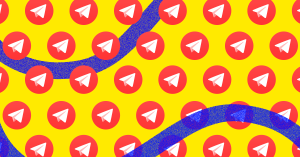 To the Russian and Iran’s governments, Telegram is spreading misinformation, hate, and a call for violence. And while a bit, er, disingenuous, their worries aren’t entirely unwarranted. The messaging app has been used to gather protestors in violent stand-offs with the government. Plus, people need a platform to connect to others while they’re organizing a revolution. Arab Spring demonstrators commonly used social media and messaging apps. But that was over seven years ago, and the internet has changed since then. Encryption has become a lot more robust, offering users (near) private channels of communication. So, yes, shutting down messaging apps is a great way for repressive regimes to look like they’re silencing dissidents. But here’s the thing: it almost never works as intended. It’s laughably easy to circumvent these bans in most cases — you can use another app. Or, if you want to keep using the same ones, users just have to make a simple change to Telegram’s proxy settings, or use a conventional VPN. There’s always the tried-and-true method of just protesting anyway: when Egyptian forces unplugged the entire nation from the internet during the Arab Spring, protesters came flooding into the streets instead. Honestly, these attempts for governments to take control of information are pretty pathetic. We’re pretty sure no one is fooled. In its effort to ban IPs associated with Telegram, Russia even managed to unintentionally knock out parts of its own alternative, TamTam. Nice work. Banning platforms where dissidents gather doesn’t stop the dissidents from dissenting. In fact, it usually just stokes the flame of protestors’ fury, exposing the forceful hands of oppressive regimes. In Iran, tensions are only growing between the government and protesters. The uprising in January that took place across a number of Iranian cities was the biggest in almost a decade. Governments’ feeble attempts at banning encrypted messaging apps won’t silence calls for political reform — it may even amplify them. Surprise! Quitting Facebook Could Be Bad for You.